THE FIRST DEFINITIVE PROOF that the universe underwent an almost unimaginably fast expansion when it was only a trillionth of a trillionth of a trillionth of a second old has taken the world by storm. This sudden growth spurt was first theorized more than three decades ago. Yet only last month did astrophysicists reveal what may be "smoking gun" evidence that the universe swelled from microscopic to cosmic size in an instant — an announcement that's being compared to the discovery of the Higgs boson. Watch the Hangout with John Carlstrom, Walter Ogburn, Michael Turner and Abigail Vieregg. What is this result and what does it mean for our understanding of the universe? On April 18, 2014, two members of the discovery team discussed the finding and its implications with two of the field’s preeminent thought leaders. Below is a modified transcript of the discussion. Edits and changes have been made by the participants to clarify spoken comments recorded during the live webcast. John Carlstrom – Deputy Director of the Kavli Institute for Cosmological Physics, and leader of two experiments that study the universe’s first light: the South Pole Telescope in Antarctica and the Sunyaev-Zeldovich Array in California. Walter Ogburn– Postdoctoral researcher at the Kavli Institute for Particle Astrophysics and Cosmology at Stanford University, and member of the BICEP2 team. Abigail Vieregg – Member of the Kavli Institute for Cosmological Physics, and assistant professor at the University of Chicago. 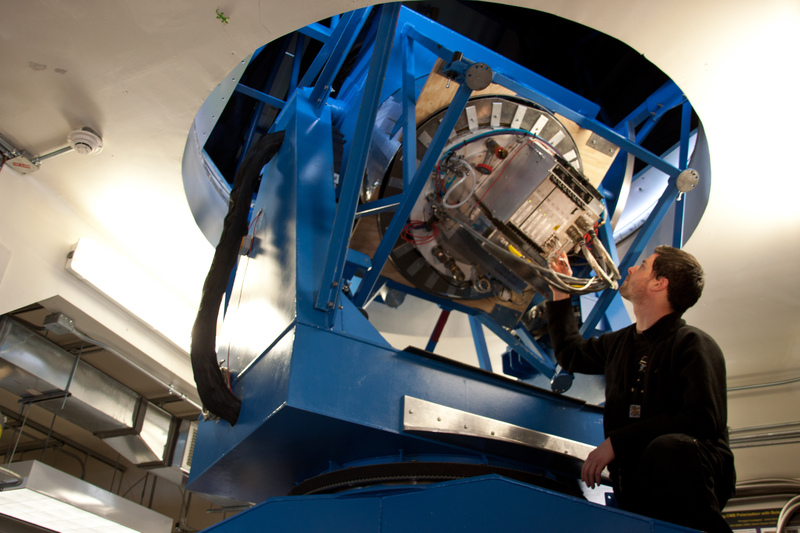 She is an active member of the BICEP2 team and in addition, she works on The Keck Array and the ANITA experiment. Michael S. Turner (Moderator) – Director of the Kavli Institute for Cosmological Physics, as well as the Bruce V. and Diana M. Rauner Distinguished Service Professor at the University of Chicago. MICHAEL TURNER: A month ago, the BICEP team awed and shocked the world of cosmology by announcing that their telescope had detected a cosmic fossil from the earliest moments of creation. For the past several decades we've had a guiding paradigm called cosmic inflation. It says that when the universe was very, very young—a fraction of a second old—it went through a tremendous growth spurt and things on the subatomic scale grew to astrophysical size, seeding all the galaxies we see today. This is a very bold idea. And now it looks like proof of this idea has actually been found. Cosmologists working at the South Pole detected cosmic swirls in the earliest light in our universe. ABIGAIL VIEREGG: That’s right. We built the telescope, called BICEP2, at the South Pole to make extremely sensitive measurements of the oldest light in the universe, light that’s from when the universe was just 380,000 years old. We looked at the characteristics of that light to learn about the universe when it was even younger. That tells us that the universe underwent an unbelievably fast expansion in that first fraction of a second. MICHAEL TURNER: How do we know that what we’re seeing is what we think we’re seeing? How do we know this is not something else between us and way back when? WALTER OGBURN: There was a long process that went into making us confident, one that lasted for more than a year. During that time, we were our own greatest skeptics. We put our own results through even more scrutiny than I’ve seen from others so far. There were a few things that made us think we had actually detected the inflationary smoking gun that we'd been looking for. The first is that we accumulated enough data that we could put a number on the statistical significance of our result, which showed that it’s not just a statistical fluctuation. This is a real signal. The second thing was to convince ourselves that the signal is not an artifact of the instrument itself. We spent a lot of time thinking of every crazy idea we could about how the telescope might make a fake signal. One by one, though, we eliminated them all. And then to make ourselves even more confident, we compared the data from BICEP2 with a second telescope called the Keck Array and then with a third telescope called BICEP1. That comparison really drove the point home that this is something that’s really on the sky. Finally, we made sure that it’s not something between us and the beginning of the universe that's just getting in the way. We did that by analyzing the best information that we have about the dust, synchrotron light and other signals within the galaxy and comparing it to what we saw. MICHAEL TURNER: So you got a really tiny signal, and you're convinced that the best explanation has something to do with inflation. We have another expert here, John Carlstrom. Let's see if you've convinced him. JOHN CARLSTROM: Well, it's a remarkable paper and a remarkable achievement. A lot of us are looking for this signal, but BICEP2 is out ahead and they have reached uncharted territory in sensitivity. Because it’s such a tiny signal, it's a little needle in a big haystack. So we’ll want to make sure that another team with another telescope will see the same signal in other parts of the sky as well. MICHAEL TURNER: You’re talking about your team, the South Pole Telescope? JOHN CARLSTROM: That would be a great team to do it, sure. We're trying, and in fact we're looking at the same sky as BICEP2, so we will hopefully cross correlate with them. But it will be important to also measure other parts of the sky as well. But it is a very remarkable achievement. I would say it's like a race. You can have a very powerful car, but to win the race, you also need a good driver and pit crew. They had the whole thing: a real winning team. It looks very good. MICHAEL TURNER: Let’s talk about the implications of this extraordinary result. What does it mean for cosmology? What does it mean for humanity? What does it mean for fundamental physics? JOHN CARLSTROM: At the fundamental level, this is saying that quantum mechanics—in effect, uncertainly—somehow generated our entire observable universe. To me, that's just incredibly profound. MICHAEL TURNER: So inflation is a big winner so far, is anyone a loser on this? Does this rule out any of our theories? JOHN CARLSTROM: There is a theory that says our universe is expanding, collapsing and expanding, in this ongoing cyclical nature. Proponents of that theory have said you should not be able to make a detection like this one, so I imagine that theory is under quite a bit of stress right now. ABIGAIL VIEREGG: To me, one of the things that's really neat about this result is that we’re probing the universe at a time when it was really, really energetic. The energy is way bigger than anything we can ever make on Earth—way bigger than you can ever make at the Large Hadron Collider—by thirteen orders of magnitude. MICHAEL TURNER: That’s right. String theorists, who think really big about origin of space, time, matter and energy, are interested in energies so far beyond the Large Hadron Collider that you can’t ever imagine building such an accelerator. But the energies this result probes are pretty darn close to what they’re thinking about. We're probing almost the highest energies that we've even imagined. particles and new fields that participated in it, and which of the many models could be correct. Inflation is a pretty big ballpark and people come up with a lot of inflationary models. So at the same time you're talking about the cyclic universe being ruled out, most of the inflationary models also seem to be ruled out. That’s because they predict that the signal would be too low for us to have seen. So I’m excited because the signal is not just a detection of something detectable, it’s a detection of something that’s big enough that we can really hope to learn a lot about it. MICHAEL TURNER: The theoretical community is abuzz. We got the signal we were looking for—that’s good—but we shouldn’t have gotten one according to the highbrow theorists who said it should be too small to detect. So we got a surprise. And often in science, that’s the case. We like the experimenters to find what we predict, but we also like surprises. In addition to the Keck Array, the two other experiments that I know that have a chance to confirm this result are the Planck satellite, which is viewing the whole sky from space, and the South Pole Telescope. When might we hear from those? JOHN CARLSTROM: The ten-meter South Pole telescope is located right next door to BICEP2 at the South Pole, which means it benefits from all the same wonderful observing conditions: the dry sky and the ability to stare out through the galaxy in a very clear patch of the sky 24 hours a day. We started a few years later, and are working very hard to get down to these sensitivity levels. I don't know when our results will come out, but we could actually think of confirming or cross-correlating it very soon. A totally independent observation will take a little bit longer. But we're not talking years; this is coming soon. ABIGAIL VIEREGG: The Planck satellite is a European space mission that released its first maps last year in March. But those maps didn’t include the data that would allow them to confirm the signal. I think they're planning on their first release sometime in October or November. So sometime in October or November we’ll hear whether Planck has the sensitivity to see this small signal, and we hope that they’ll confirm. Until then, they’re keeping their cards close to their chest. JOHN CARLSTROM: These analyses, especially for an all-sky measurement like Planck’s doing, are going to be hard. They’re going to need to really understand their noise and their survey. We all hope they succeed, but they’ve got their work cut out for them. WALTER OGBURN: That's right. Planck really has a different set of challenges than BICEP2 or the Keck Array because our telescopes were designed from start to finish to find this signal from inflation. And Planck is trying to do a lot of things on the entire sky. It’s looking at much smaller scales and it’s looking at much bigger scales. And so in some ways they have a more complicated set of analysis problems to solve. It means that they’ll also have a lot of interesting things to say about the galactic signals—the synchrotron emission, dust, and polarization that's relevant for what we're doing. So Planck will have a lot to say whatever their sensitivity ends up being. We’re all eagerly waiting to hear what they have. MICHAEL TURNER: Is there any other experiment that on the horizon that might be able to shed some light on this? JOHN CARLSTROM: There are a number other experiments at various stages, not just at the South Pole but also mounted in the high desert in Chile. So in a number of years, if the signal is real and if the level is as high as they say, then we’re going to start learning a lot about the signal. More than just confirming it, we’ll actually measure it very precisely and be able to go on from there. We've also all been talking about getting together to build the next generation experiment. This would be a really big effort to go after this signal and characterize it. We put this collaboration loosely together and mapped out what we would do before these results came out. Our strategy has been to make sure we go deep enough to the get the signal or find out it's unmeasurable. So here we are, in the middle of all of that, and the signal comes out to be as strong as it could possibly be. So we're poised to go after this signal, measure it over the whole sky, and not just detect it but also measure how it scales. At smaller scales, does the signal get smaller and smaller, as you would predict? Does it do it at the right rate? Does it do it as predicted by the models of inflation? That will hopefully tell us something about how inflation started. It will tell us about what we can learn about physics at these extremely high energies. And it will also tell us whether local gravity wave detectors like successors to LIGO will ever have a chance at measuring these signals. MICHAEL TURNER: There's one fly in the ointment that I'm really curious about. The BICEP team has detected this as a big, big signal—well it’s not big-big, it’s actually quite small, but it's statistically significant and there’s no question that something is there—but theory also says that you should see it just in the temperature maps of the early universe. John’s South Pole Telescope team published a paper a year or so ago looking for the signature just in the temperature. And their upper limit is about a factor of two below what was detected. When we’re polite we call that tension. Others might call it a contradiction. Is there a crack in the cosmic egg here? Is it not that something’s wrong with the experiments but that something’s wrong with the theory? JOHN CARLSTROM: There have been hints for a while now that maybe something else is going on. Maybe we need to allow some new physics in there. That would require extremely strong confirmation before we believe it, but that's the exciting crack in the egg. Maybe we have even more physics to learn. Maybe there are more neutrinos. Maybe they’re more massive than we thought. Or maybe it’s something none of us have thought of yet. As an experimentalist especially, I think that’s really exciting. MICHAEL TURNER: We seem to be converging on a picture—this idea of inflation—but maybe we're just way off base. I don't think so, but maybe we are. JOHN CARLSTROM: It could be, but I think it’s just remarkable that these measurements are right on the money with the theoretical predictions. Now we do need to adjust the parameters to make them fit, but the parameters are not new physics—they’re just parts of the model. So it's all looking good. But I, for one, think it'd be great to find this new crack and explore it. That's where the new insights and new physics will come from. MICHAEL TURNER: How big is this? I think this is bigger than the Higgs. What do you think? How big is this discovery? WALTER OGBURN: One of the things that really excites me the most is just looking at the BICEP2 map and seeing that each of the spots is an imprint of a quantum fluctuation that existed as inflation was happening. This is something that we've been looking for a hint of for decades. Even back in Einstein's lifetime, he was trying to find ways to put general relativity together with the other forces and combine them into one theory of everything. People have come up with string theory and with many other ideas for how you go about that. Maybe this is the first evidence for which of those ideas can be right which ones could be wrong. Every time I look at that map, that's what I'm thinking about. Every spot is quantum gravity. JOHN CARLSTROM: Another way to think about how big this is—at least to some people—is to think about the leaders of this BICEP group. Ten years ago—or more than that—they dedicated themselves to this experiment and poured everything into it. And this is the one thing it could do. It was worth it to them, even though the prediction from many people was that this was unmeasureable. But they felt that it was just so important to check because the implications would be so profound. So they went for it. I think it’s huge. Quantum gravity. Energies at enormous scales. Smoking-gun of inflation. It’s hard to downplay any of that. It’s amazing. ABIGAIL VIEREGG: It’s a funny thing when you’re on the inside of a discovery like this. It’s only when you release the results to the world and watch the reaction of the community that, at least for me, it really hits home how important it is. If this is what we think it is, it’s a very big deal. MICHAEL TURNER: This is so big that we haven’t fully understood the implications yet. And I think that all of us are just the tiniest little bit nervous that maybe this is too good to be true. It’s quacking like a duck, but is it really a duck? We're going to hear a lot more about this. Cosmologists are just having a ball with this new discovery.